Two strangers Journey towards a mysterious mountain. Oh good grief. 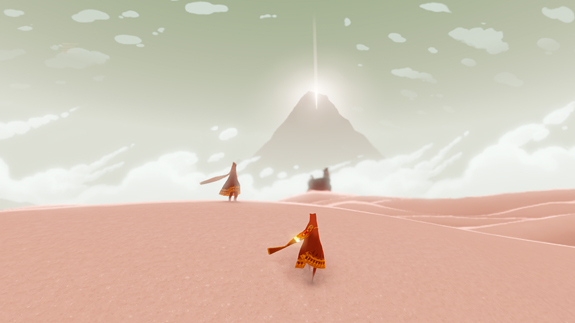 I just experienced Journey on the PS3 – by ThatGameCompany. I know I was looking forward to it – they made Flower after all – but I was… well blown away is too crude a phrase. I was deeply affected by it. There are few games that instantly re-trigger emotions at the mere mention of their names, or seeing their logo or screenshots, but Flower from That Game Company, is one of them. Every time I am reminded of it, I am suddenly hit by a wash of calm, of peaceful yearning and of a desire for beauty for beauty’s sake. Few games have you play as the gentle breeze that lifts petals on their adventure – fewer still can draw you in to a narrative that has no words, no actors or actresses, no evil villain, fighting or death. It’s a game that had my friends try to argue was not a game – despite me waxing lyrical about it. So when I saw that That Game Company were releasing a new game after Flower, I was interested. When I learned that Journey has you exploring mystical sand dunes, occasionally encountering other wanderers and singing into the long, lonely desert with them, I developed dangerously high hopes. If the game can trigger even the faintest hint of the emotional hold that Flower has over me, I’ll consider it a resounding success – because despite having ‘finished’ Flower several times, I still yearn to return to it, like a favorite old book, comfortable in the well worn pages, enjoying it for the never fading beauty of the world it conjures and the very personal place it always leaves for me.